What was once a side project on a front porch has evolved into a family-owned brewery that’s received multiple honors at the Best Florida Beer Championship. This spot showcases the owners’ passion for brews, pizzas, the outdoors and pure, natural flavors. The company proudly brews bold tastes, minus the fake flavors. While you’re there, don’t miss the Elvis Peanut Butter Banana Sandwich Brown Ale! WHAT: Persimmon Hollow Brewing Co. If you’re in the mood for an artistic environment, a tasty brew and good conversation, head to the heart of historic downtown DeLand. At Persimmon Hollow Brewing Company, the back door opens onto Artisan Alley, home of several great boutiques, restaurants and a Friday night farmers market. Here, you can choose from a wide variety of craft beer that ranges from stouts to coffee porters to good ol’ American wheat ales. Plus, there’s always something fun going on here, from yoga to trivia in the taproom. This hidden gem located in Ormond by the Sea is a favorite hang for locals. The pub has 11 unique beers on tap — although wine is also available if you are feeling like grapes are the way to go. With Ping-Pong tables, weekly food trucks, frequent tournaments and a casual atmosphere, you’ll feel right at home here. Head over to Rock Bottom Brewery, a three-story restaurant and brewery at ONE DAYTONA across from Daytona International Speedway. Here, expect to find fresh, handcrafted brews made on-site and premium comfort food. Plus, you’ll be able to enjoy the view from the rooftop bar, which offers expansive views of the Speedway and overlooks any live entertainment happening in Victory Circle. This taproom features a wide array of delicious brews, ranging from the lightest of summer ales to pitch-dark stouts. Many are brewed right on-site, such as the Daytona Beachin’ Summer Ale, an American-style pale ale that tastes best after (or during) a long, hot day in the sunshine. Or, get a taste of the Trioval Tripel, a classic Belgian-style ale with a golden straw color and a crisp, fruity flavor. One of the best things about Daytona Beach Brewing Company is that the employees are knowledgeable, and are happy to answer questions you have. Plus, food trucks are usually on site — think tacos, sandwiches, Southern BBQ — and all of it is mouthwatering! Ormond Brewing Company is one of Volusia County’s first breweries, and is partially responsible for the exploding craft beer scene in Daytona Beach. The company specializes in unique, flavorful beers brewed right on site. For example, beers are enhanced by infusing interesting flavors like mango and habanero, or chocolate with bacon. Sip and savor inside the relaxing tavern or kick back in the beer garden. Open mic happens on the first Thursday of the month, and live music is featured every Friday and Saturday night. Another one of the county’s original craft beer bars, Odd Elixir Meads has enjoyed a wide variety of recognition and rewards since opening in 2006. This small batch meadery is located inside DeLand Abbey in historic downtown DeLand. The draft list is updated each morning and features a variety of local and domestic brews. And, all meads are crafted on site in the Abbey. Odd Elixir’s approach to meads merges traditional techniques with a creative approach to ingredients and flavor integration. In addition to getting creative with beverages, Odd Elixir is committed to finding ways to working with the local community as much as possible. Are your tastebuds tingling yet? Don’t wait! 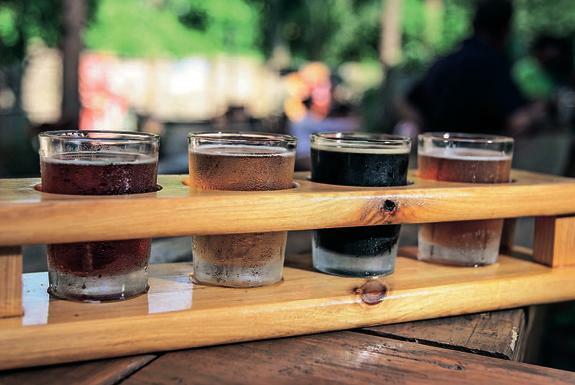 Plan your trip and your exploration of Daytona Beach’s craft beer scene today!